FOR a solid week storms saturated Bucharest. On the first day of relief, I put away my foul weather gear, joined the young, chicly dressed Romanians who had just emerged on Calea Victoriei, the city's main artery, and set out to enjoy the architectural treasure chest that is the Romanian capital. As the sun burned through the clouds that fall afternoon, the city's cultural influences - outlined in the worn neo-Classical, Art Nouveau and blocky Communist-era structures - were revealed. Within these old buildings, many of them recently renovated, stores like Max Mara and Escada are continually sprouting, helping to transform Bucharest's image as Communist hangover to that of a steadily modernizing city hoping to be the capital of a European Union nation as early as January 2007. It was hard to believe that I was standing at the former nexus of an ironfisted regime that in the 1980's was arguably closer to North Korea's brand of Communism than to the Eastern Bloc's. 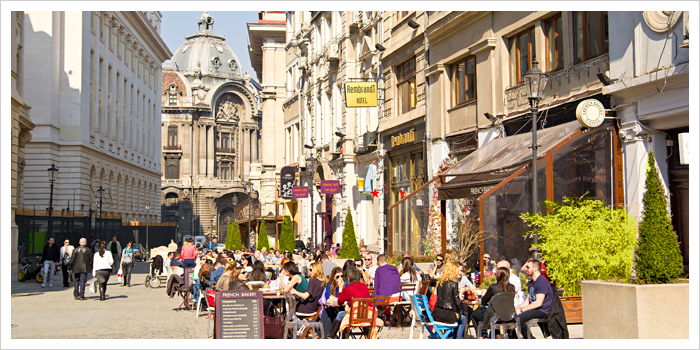 Less difficult to imagine was Bucharest's earlier history, dating back to the turn of the 20th century when the city was known as the Paris of the East because of its affection for everything French - from food to fashion to architecture. Now Bucharest is redefining itself again, and in the process, it is fast becoming an intriguing alternative destination in Europe. In the last year alone, there has been a 24 percent increase in tourism from the United States, according to the national tourist office in New York. And though the city has a ways to go before its rough edges are smoothed out, the anticipation of what the future might bring is palpable. This impression could be said to exist to a lesser extent all over Eastern Europe. But this isn't Pragueor Budapest. Bucharest is deep in the Balkans and the end of Communism wasn't facilitated by a velvet revolution. When Nicolae Ceausescu, Romania's megalomaniacal dictator, was ousted in 1989, the cost was around 1,000 lives. The dictator himself was hunted down and shot. Perhaps no place in Bucharest, population 2.1 million, represents the hope of what change may bring than the city's historic center: a mostly neglected collection of streets in an area of town long overdue for a revitalization plan that will be carried out by the end of 2006, according to Bucharest's mayor, Adriean Videanu. It is known locally as Lipscani because Lipscani Street, its east-west axis, acts as its anchor. Some Romanians call the area the Lipscani ruins. Yet, the center - which was established in the 15th century by Vlad (the Impaler) Tepes, who is thought to have been the inspiration for Bram Stoker's Dracula - is the site of many marquee attractions. These include the stone-columned remains of the 15th-century Prince's Palace and Stavropoleos Church, which was built in 1724 by a Greek monk in the Byzantine style. In the southeast corner of this historic area, Manuc's Inn was built around 1808 to serve merchants on the trade route between the Ottoman Empire and Europe. 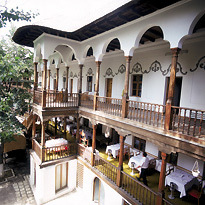 Today, inside its courtyard - complete with encircling wooden balconies - a functioning hotel, restaurant and wine cellar still seem primed to play host to rowdies and prostitutes. As I turned into Lipscani from Calea Victoriei, women in high heels hurried across the avenue just ahead of notoriously wild Romanian drivers. It was now dusk. Streetlights flickered to life and the keepers of a corner shop selling the last of its fresh Romanian pretzels called covrigi pulled the metal-wire guard over the window. Even with the crumbling facades of the former town houses, bistros and banks, it wasn't difficult to imagine how the pedestrian-only district, pre-Ceausescu, could, given the resources, become the city's tourist engine. At a cafe, Françoise Pamfil, an architect and lecturer at the Ion Mincu University of Architecture and Urbanism, told me: "During Ceausescu's time, people started not to care about public spaces. If it wasn't yours, and it was shared, it looked awful. If you extend that thinking, you can see how people forgot to celebrate public places. It's a deep wound." But with a smattering of new restaurants and boutiques, it would seem that the wound is healing. On the wall of the Amsterdam Grand Cafe, a restaurant and bar with a cosmopolitan feel, a poster read "YES to Revitalization of the historic center. NO to Isolation." As I ate tortellini formaggio, served with ham and Parmesan, a chorus of languages filled the dining room. Upstairs, a tango lesson was in full swing. "I don't just think Bucharest is on its way up, I see it going up every day," said Jerry van Schaik, the general manager of the cafe. "There's a buzz in town - people starting businesses, construction is booming, underground initiatives are taken." Another diner, Mark Nava, an American screenwriter, was equally enthusiastic. "It's been really cool to see how this place has changed," said Mr. Nava, who has lived in Romania - an increasingly popular place for filmmakers ("Cold Mountain," most prominently) - since 1998. "There's a bohemian Moulin Rouge atmosphere - you can feel the ghosts and the romance." Later, at an outdoor beer garden called Terasa La Ruine, the Rolling Stones' "Emotional Rescue" spilled across Lipscani Street and young residents in Levis and D & G apparel mingled with tourists. As I drank a local Bergenbier for about 2 new lei (around 65 cents, at 3.12 new lei to the dollar), I was reminded of what Michael Guest, the United States ambassador to Romania from 2001 to 2004, had recently told me in an e-mail message about the historic center: "A number of us in the expatriate community felt that with the right combination of historic preservation, infrastructure development and marketing, Lipscani could become a tourism draw for Bucharest." 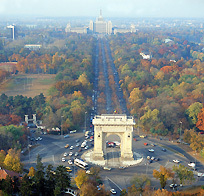 It may be that the real strength of Bucharest is in how much it pushes its visitors to understand it on its own terms. For all the places that claim the moniker of "the gateway to the East," it takes little more effort than opening an Atlas to see that geography - between the Occident and Orient - tugs at the fiber of Bucharest. "Bucharest is the reference city for the integration of European and Oriental civilizations," Mayor Videanu told me in another e-mail message. "Today's capital city is the center of spiritual, cultural and political reassertion of a people with old European values." When I asked Mr. Guest why a tourist should go to Bucharest, his answer was less dramatic. "Somehow, it manages to carry a certain exoticism," he wrote, "yet without seeming too far removed from the norms of any other Western city." The next day I walked north of the city center along tranquil, tree-lined Soseaua Kiseleff Street, reminiscent of Paris and home to the city's mansion district. I passed through a 75-foot version of the Arc de Triomphe, erected in 1935, and made my way to two main, contrasting points of interest: the Village Museum and the Palace of Parliament. A five-minute walk north of the arc is the outdoor Village Museum, which was established in 1936 to preserve a record of Romania's village life. It is an off-kilter, forested collection of more than 50 structures from different regions of the country, including Wallachia, Transylvania and Moldavia. Starting in 1935, many of the stone and wooden houses, workshops and churches were transported piece by piece to the site. The Palace of Parliament, on the other hand, is a place that defines the darkest days for Bucharest, and is, in every way, the biggest attraction in town. Construction began in 1984 on the project, which is generally called the People's Palace and overflows with marble, crystal and lavishly furnished rooms. It is, at more than 3.7 million square feet, the world's second largest office building (after the Pentagon) and dovetails with both the downfall of the Ceausescu regime and the destruction of some of the oldest areas of town - almost 1,000 acres, an area bigger than Central Park - with thousands of homes razed for the monolith. During my 45-minute guided tour of the palace (in which I saw roughly 5 percent of the building and its 1,000 rooms), I was told that the people of Bucharest starved while Ceausescu spent billions on a structure he never got to enjoy. Meant to be a living monument to the dictator, it was never truly completed. Back in the city center that afternoon, I decided to see how much I could do in one night for $40. My first stop was the National Art Museum, where a traveling exhibition called "Ombre et Lumières" from several French museums was in its last days in Romania. 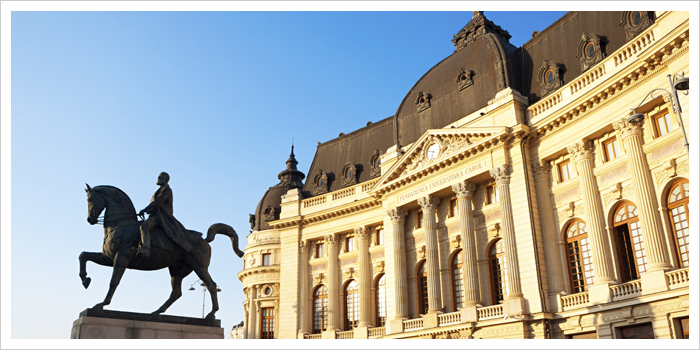 Housed in the 19th-century Royal Palace, the museum displays thousands of pieces by Romanians and masters like Rubens, Rembrandt and Monet. 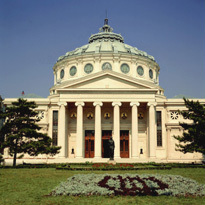 The Romanian Athenaeum, home to the George Enescu Philharmonic Orchestra since 1888, was next. Inside this magnificent concert hall, with its interior of swirling marble and a giant fresco depicting Romanian history, I took in a concert of Strauss, Bach, Mozart and Brahms. With about $30 left, I dined at Restaurant Balthazar, which combines French and Asian cuisines. It is wedged into a beautiful old villa and is a favorite of diplomats and the jet set. After a dinner of duck with caramelized pineapple and wild berry sauce, and a glass of Cotes du Rhône, I had $10 left, and set off for Green Hours 22 Club Jazz Cafe, for some music and a trio of dark Silva beers. That left me with just enough lei for a nightcap at the Laptaria Enache, a bar atop the National Theater. The bar and its rooftop neighbor, La Motor, was filled with university students, artists, musicians and young professionals. I wandered back onto Calea Victoriei just as the night seemed to be revving up: neon lights backlit hip young crowds and French-inspired Belle Époque buildings. A convoy with a Porsche Cayenne, a BMW X5 and a Mercedes S600 roared past Revolution Square, where Ceausescu was booed off the balcony of the Central Committee of the Communist Party building in 1989. Squeezing between scaffoldings and party-going crowds on temporary wooden sidewalks, a statement I'd heard over and over again in describing Bucharest - "Europe as it used to be" - came to mind. At that moment, a European city in the making seemed more appropriate. There is no tourist office in Bucharest yet. But travel information is available from the Romanian National Tourist Office in New York, 212-545-8484, and at www.romaniatourism.com. Through 2006, both the old and new lei, which essentially lops four digits off the old lei, will be in circulation, so prices can be in either. The exchange rates to the dollar are 31,185 lei, and 3.12 new lei. Many airlines go to Bucharest from the United States through other European cities, but not nonstop. In mid-December, a Web search found mid-January fares starting at $566. The dialing codes are 40 for Romania and 21 for Bucharest. The Rembrandt Hotel, in the historic center at 11 Smardan Street, 313-9315, www.rembrandt.ro, has 15 homey rooms - leather armchairs and Tiffany-style desk lamps - that, with tax, range from 85 to 135 euros (about $102 to $162, at $1.20 to the euro). High-speed Internet, a bar and bistro, and 24-hour room service are among the amenities. Overlooking Revolution Square, Athénée Palace Hilton, 1-3 Episcopiei Street, is the grande dame of Bucharest hotels. Built in 1914, the hotel is swathed in marble, has 272 rooms that range from 340 to 830 euros, five restaurants, wireless Internet and a health club. Information: 303-3777; www.hilton.com. Amsterdam Grand Cafe, 6 Covaci Street, 313-7581, serves everything from quesadillas to chicken satay, and has a varied wine list. A meal for two, with drinks, runs about $25. Balthazar, 2 Dumbrava Rosie, 212-1460, offers French-Asian-inspired lunches and dinner, and is a perfect example of how much quality you can get in Bucharest for almost nothing. Dinner with wine cost me less than $15. The Village Museum, in north Bucharest at 28-30 Soseaua Kiseleff, displays Romania's bucolic history with 50 houses, shops and churches from all over the country. Open Tuesday through Sunday. Entry is 5 new lei. Information: 222-9110, www.muzeul-satului.ro. The Palace of Parliament, 1 Calea 13 Septembrie, 311-3611, thought to be a catastrophic blunder from both an architecture and social fabric perspective, has somehow turned into a bragging point rather than a monument to an ironfisted dictator. Open daily; 20 new lei. Housed inside the Royal Palace at 49-53 Calea Victoriei, the National Art Museum is full of great works by the likes of Rubens, Monet, Rembrandt and El Greco. It is open Wednesday through Sunday, and entry is 12 new lei. Information: 314-8119 and online at art.museum.ro/museum.html. Cristian Florea runs CRIF Tours, 444-0164, www.discoverromania.ro, and leads individuals and groups through Bucharest or elsewhere in Romania. He speaks English extremely well and is well-versed in Romanian history. A Unique Romanian Cheese - Transylvanians maintain a centuries-old culinary tradition. Transylvanian town keeps its medieval charm and grace.